Should a teacher reward a whole class for the good deeds of one student? What about the other side of the discipline picture: should a whole class be punished for the misdeeds of just a few students? As we know, children also care about the way rewards and punishments are allocated. I study how children think about fair punishment and reward, and how that thinking changes as children develop and gain more experience in the social world. Understanding how children view fair allocations of punishments and rewards can give parents and teachers more insight into how children of different ages may react to common discipline practices. Much of the research in this area has focused on how children think about fair ways to distribute rewarding items or consequences. For example, in a series of studies I conducted a few years ago with Peter Blake, a researcher at Boston University, and Paul Harris at the Harvard Graduate School of Education, three-to-eight-year-old children were given four stickers and had the chance to share any number they wanted with another child. Any stickers they didn’t share, they kept for themselves. We found that the seven-to-eight-year-olds tended to share the stickers equally, while the younger children tended to keep most or all of the stickers for themselves. However, one finding was common to the preschoolers and the older elementary school children alike: all asserted that the stickers should be shared evenly. We concluded that from an early age, children are aware of local norms related to fair sharing, but it’s not until age seven or eight that they consistently follow such norms. This was further corroborated by findings from another study that also shows that by around age eight, children in the U.S. follow norms of fairness even when it means having less for oneself. There are many situations, however, where one person is more deserving of rewards than another person. How do children think about these types of scenarios? In a study by Nicolas Baumard of the Ecole Normale Supérieure (a French university) and his colleagues, preschool-age children were told about two characters, one who worked hard to make a batch of cookies and another who slacked. The study participants then had the chance to hand out three cookies to the two characters in any way they wanted. The most common response from the preschoolers was to give one cookie to the hard worker and one to the slacker. This approach to allocation involved not allocating the third cookie to either character. Later, when cued by the experimenter to hand out the last, unallocated cookie, nearly 70 percent of the children gave the last cookie to the harder worker. What we notice in these findings is that young children understand that some people may be more deserving of reward than others, but they nonetheless often prefer to hand out rewards equally if given the chance. Other studies, such as this one, have demonstrated a shift from a preference for equality in early childhood to a preference for equity, or “deservingness-based” allocation, when children reach middle childhood. More recently, my colleague Felix Warneken at Harvard University and I decided to investigate a related issue: what do children think about the fair allocation of punishments? As they do with rewards, do young children prefer to spread punishments out equally, and do older children prefer to focus punishment on those who are most deserving? In a newly published study, we showed 123 four-to-10-year-olds classroom situations that involved one student doing more of good or bad things than another student. We also showed the same classroom scenarios to a comparison group of 93 adults. The scenarios are summarized in the table below. 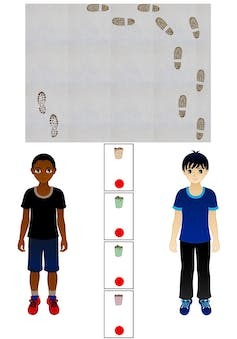 Further, the image provided here illustrates one classroom scenario, in which one student ignored the teacher’s request to take off his shoes and made more of a mess than the other student. Example question: How to best allocate four unpleasant classroom jobs to two students, one who made more of a mess than the other. For this particular scenario, study participants then had the chance to hand out four punishments (emptying four dirty trash cans) in whatever way seemed most fair. A key question about a scenario like this is, do the younger children prefer to hand out the punishments equally, even though one student is less deserving of punishment than the other? The four-to-five-year-olds were the ones most likely to prefer that both rewards and punishments be distributed equally across two people, even if one of the people had done more of a good or bad thing than the other. As in the scenario illustrated above, where one student made more of a mess than the other, the preschool-age participants often gave two punishments to each of the characters. By contrast, the older children and adults in the study preferred equitable allocations of rewards and punishments, where a person who does more good gets more reward, and a person who does more bad gets more punishment.All children in the study had tracked and remembered the behavior of the characters in the scenarios; the preference for equal distributions on the part of the young children was not due to a failure of memory. In other words, the developmental shift toward a preference for allocating discipline based on deservingness – and away from a consistent preference for equal allocation – is very similar where both rewards and punishments are concerned. This is a very novel finding in research with children, where attention has been focused primarily on how children think about fair rewards. Further, we also presented participants with extreme examples of unbalanced rewards and punishments. We showed them scenarios in which a whole classroom of children was rewarded or punished for the positive or negative behavior of one student. The preschoolers were the most likely to judge these instances of collective discipline as fair, whereas the older children and adults were much more likely to judge the practices of collective punishment and collective rewarding as unfair: 40 percent of the four-to-five-year-olds viewed the collective punishment scenario as fair, compared to only 3 percent of the eight-to-10-year-olds – a striking difference. Interestingly, 15 percent of the adults judged punishing a whole class for the misbehavior of one student to be fair (a bit of a jump up from the eight-to-10-year-olds). What’s happening here? Why were the preschoolers most likely to allocate punishments equally, even to those not responsible for a misdeed? Why were the youngest children most likely to view punishing a whole class as fair, even if only one student did something wrong? First, a key point is that the youngest kids aren’t necessarily the harshest; it’s simply that their idea of fairness is different. Many of the young children who viewed targeted punishments as unfair and collective punishments as fair talked about the upset feelings of individuals who get singled out for punishment. Virtually none of the older children and adults talked about this. Thus, younger children may simply be motivated to avoid making any one person’s feelings very different from everyone else’s. For adults who work with children, the findings suggest, among other things, that children of different ages may react differently to certain approaches to discipline. For example, a teacher who consistently rewards a whole class for the good deed of one student might be seen as very fair by young children, but as less fair by older children. Likewise, our findings suggest that most school-age children will react very negatively to the not uncommon practice of punishing everyone for the misdeeds of one or a few. Many exciting and important questions lie ahead in this line of research. For example, how are collective punishments and rewards used with children in contexts such as schools and team sports? In my own experience as a parent, I hear about the use of collective punishments in schools on a regular basis. One student breaks a rule by going into the building before the bell on a bitterly cold day, so the entire class is made to wait outside, shivering, for 10 extra minutes. One student commits a slide tackle during soccer at recess, so the entire grade is prevented from playing soccer for a whole week. How do children react to such discipline practices in the real world? Are such approaches effective, or do they have unintended consequences, such as the undermining of child-adult relationships? And does the use of collective punishments lead to self-policing among children, as many adults who use it might hope that it will? We hope to have answers in the near future as we continue to explore how people think about fairness, and how this impacts our social behavior and relationships. Craig Smith is a Research Investigator at the University of Michigan.